The collaboration of agents can undertake complicated tasks that cannot be handled well by a single agent. This is even true for excecuting multiple goals at the same time. 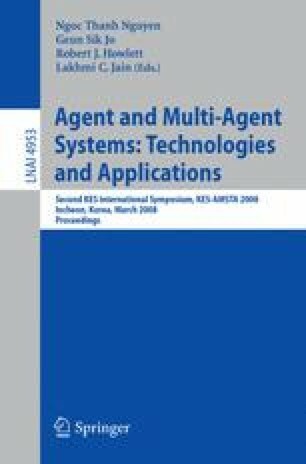 In this paper, we demonstrate the use of trading agent collaboration in integrating multiple trading strategies. Trading agents are used for developing quality trading strategies to support smart actions in the market. Evolutionary trading agents are armed with evolutionary computing capability to optimize strategy parameters. To develop even smarter trading strategies (we call golden strategies), multiple Evolutionary and Collaborative trading agents negotiate with each other for m loops to search multiple local strategies with best parameter combinations. They also integrate multiple classes of strategies for trading agents to achieve the best global objectives acceptable for trader needs. Tests of five classes of trading strategies in ten years of five markets of data have shown that agent collaboration for strategy integration can achieve much better performance of trading compared with that of either individually optimized or randomly chosen strategies. This work is sponsored by Australian Research Council Discovery Grant (DP0773412, LP0775041, DP0667060), and UTS internal grants.